​​Fulham will want to build on their first victory of the Premier League season, when they travel to the Amex Stadium to face ​Brighton & Hove Albion on Saturday. Both sides have three points to their name after as many games and will be looking to get a good result in what both managers will view as an eminently winnable fixture. Brighton have lost to ​Watford and ​Liverpool away from home so far this season, but have been impressive at home, earning a shock 3-2 win over ​Manchester United last time out in the league. Fulham won 4-2 against ​Burnley in their last match, following defeats to Tottenham Hotspur and Crystal Palace. Here's everything you need to know about this clash. In a season to forget for Fulham supporters, this Friday night fixture was one to definitely scrub from the history books as second-placed Brighton beat a 17th-placed Fulham very convincingly at the Amex. 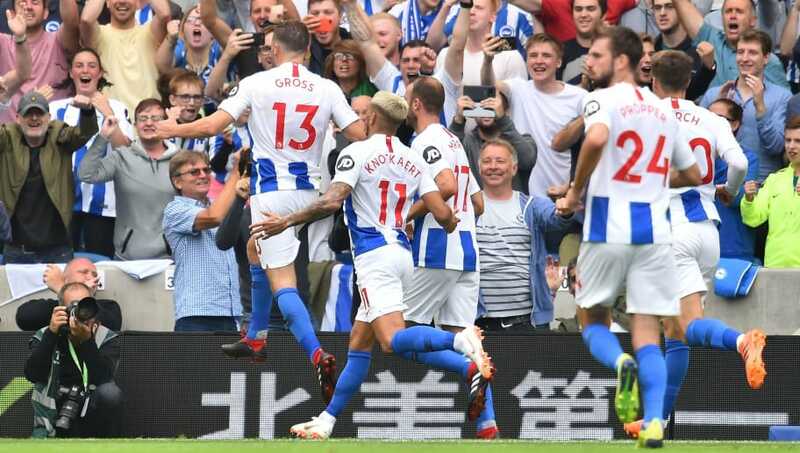 A hat-trick from Israeli striker Tomer Hemed helped the Seagulls to a dominant victory, with goals from defender Bruno and talisman Anthony Knockaert rounding off the victory. The mid-April victory continued to keep Brighton in with a chance at automatic promotion that season, with four games to go, as they battled it out with fellow promotion contenders ​Middlesbrough and ​Burnley. With his usual centre back partner Lewis Dunk out injured, responsibility to wrangle the powerful Fulham striker Aleksandar Mitrovic will fall on Shane Duffy. The Irishman is an experienced defender and no small figure but it will take all of his skill and strength to deal with a prospect like Mitrovic. As for the Serbian striker, he's hit the ground running with the same speed he maintained in the Championship last term. Having made last season's loan move from Newcastle permanent, the bullish centre forward is showing the North East what they let go - scoring three goals in three games. He's a fantastic attacking threat for Fulham, who have added the quality around him to provide and it will be an interesting battle to see if the striker can out-muscle his opponent in Duffy. Brighton defender Dunk is still expected to be out injured, having suffered an ankle injury against Manchester United. Defender Bruno was unavailable for Brighton's cup game due to a hamstring problem and is in doubt for this match too. Jose Izquierdo and Florian Andone are also both injured, with knee and groin problems respectively. Fulham have struggled with injuries problems at the start of this season, with Tim Ream, Floyd Ayite and Alfie Mawson all missing the start of the Premier League campaign. Winger Neeskens Kebano was stretchered off during Fulham's cup match against Exeter with an ankle problem. Brighton: Ryan; Montoya, Duffy, Balogan, Bong; Knockaert, Propper, Stephens, Groß, March; Murray. Fulham: Bettinelli; Fosu-Mensah, Odoi, Le Marchand, Bryan; Seri, McDonald, Cairney; Schurrle, Mitrovic, Vietto. As impressive as Brighton have been, particularly against Manchester United, this game just has a slow, tense affair written all over it. The home side also come into the game on the back of a loss to Liverpool - though they did play well in that game - and a cup exit to ​Southampton. Fulham, meanwhile, are in good form with wins against Burnley and in the cup over Exeter. In the end, the physicality and relentlessness of Fulham may just be too much for the home side and give the London visitors the win on the south coast.